Beginning in Baltimore, Maryland and crossing six states, the National Road travels over 700 miles, past historic landmarks, forested mountains, industrial towns and modern cities, rich farmland and pastures, to reach the Mississippi River and the Eads Bridge at East St. Louis, Illinois. 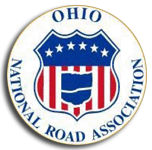 Conceived by Albert Gallatin, Secretary of the Treasury under Thomas Jefferson, the National Road was the nation’s first federally funded interstate highway. It opened the nation to the west and became a corridor for the movement of goods and people.